Cyberpunk is best described as a movement, at least in so far as it's inception. A "natural" end or conclusion to a movement in capitalism is for it to either be quashed... or for it to become a popular commodity that is co-opted into different aspects of our society. A fairly insular group of authors generated the initial first wave of cyberpunk, that is, those books published from approximately 1982 to around 1991. These works generally had reoccurring tropes and themes, which is how we come to our shorthand definition for cyberpunk now: high-tech, low-life. William Gibson, the author of Neuromancer, has said before that the movement of cyberpunk is due to this particular group of writers all networking and discussing ideas to subvert and forge a new path within science fiction. It was somewhat of a clique. Naturally, all of these manuscripts were submitted for publication around the same time resulting in an influx of these commonalities. Beyond the high-tech and low-life, though, cyberpunk fiction is usually fast paced (especially when measured against science fiction published at that time and previously), heavy on information, and condensed. It also tends to borrow heavily from romanticism and horror, particularly when examining the purpose of cybernetics in cyberpunk fiction, these I would say are not ubiquitous and so less useful for my purposes here. However, what is relevant is this idea that cyberpunk needed to constantly be iterative in order to stay relevant and for it to be ahead of mainstream culture appropriating aspects of it as it was consumed by a growing readership. The cyberpunk aesthetic, so to speak, worked against it because for it to stay "punk", it needed to be transgressive and remain "cool" and outside of the mainstream consciousness. Once an aesthetic is popularized it also draws the risk of being more-or-less completely assimilated. As more authors latched onto the tropes and subject matter found in cyberpunk, we can see that aspects of the sub-genre have been internalized by many facets of our current culture. Music, fashion, movies. Cyberpunk was assimilated in relatively short order and quite comprehensively. When this began to happen the initial cadre of cyberpunks themselves declared it all but dead. The death of the cyberpunk movement within science fiction served its purpose, however. Shaking up the genre while simultaneously thrusting it into popularity. Intelligent and more interesting science fiction that was more relevant than ever was birthed from it. But people conflate the death of the movement with the death of the sub-genre. While both were co-opted, a sub-genre is far more complex a creature and harder to kill. With hindsight we see that the sub-genre is still relevant, even growing more diverse than when it was declared dead and most popular. In fact, feminist cyberpunk began to be released around the time it was dead. The specific time of death of the movement is usually ascribed to either when Johnny Mnemonic the movie was released in 1995, or when Snow Crash was published in 1992, satirizing and deconstructing the genre and its tropes. The later is when the literary sub-genre splintered. 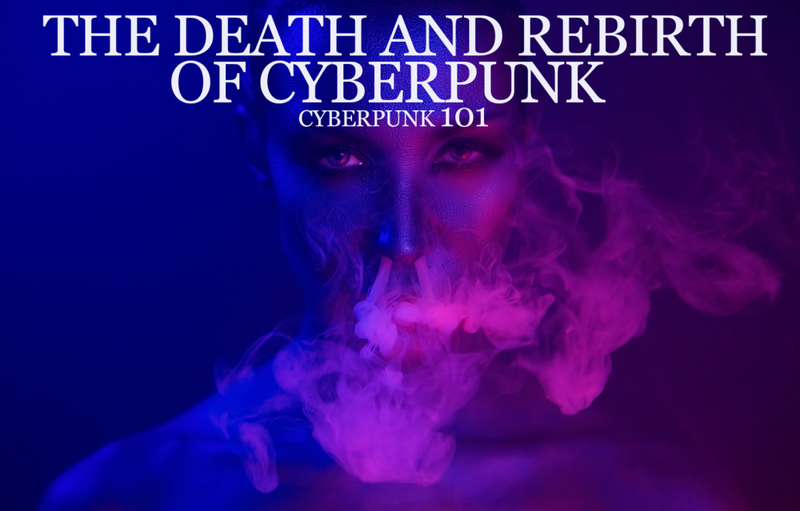 Cyberpunk fiction continues to be released, contributing to the genre, while this second form marked by Snow Crash's release aims to struggle against the established conventions of cyberpunk. This is post-cyberpunk. Cyberpunk released from that point on is considered the second wave of cyberpunk fiction. A third wave also emerged in the early 2000's; generally marked by the release of Accelerando by Charles Stross in 2006. These authors aim to "distill … cyberpunk into something that works again, from the point of view of someone who has actually gone through a dotcom start-up, worked on the 'Net, worked as a programmer". When classifying cyberpunk fiction then, you can label something as cyberpunk or post-cyberpunk, assigning different waves to the literature as a shorthand to communicate what the author is trying to accomplish and what tropes you might expect to find. Plenty of fiction this year and the last is still categorized as cyberpunk and post-cyberpunk by myself and others. Does it lean into the trope? The high-tech, low-life; or does it deconstruct it and try to critically examine it? Either way, cyberpunk as a sub-genre is actually quite healthy and continues to be iterative and be more relevant than ever, as I will explore in future cyberpunk 101 posts.